NuMedica OsteoMedica provides MCHC (microcrystalline hydroxyapatite concentrate) that are derived from New Zealand open-range, pasture-fed cattle. These cattle are raised in a pesticide-free environment. This concentrate is effective for providing bone support. Cold-processing technology is employed to preserve the organic factors contained in the concentrate, which is highly absorbable by the human body where it can enhance bone health. 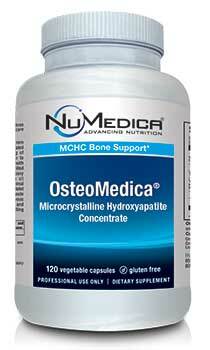 NuMedica OsteoMedica contains an active protein matrix that complements this formula's bone growth factors. Studies have shown that this formula is a highly beneficial support for bone health. 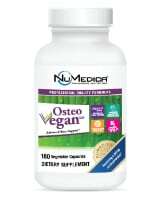 NuMedica OsteoMedica also contains magnesium and vitamin D to round out its healthful formula design. Calcium, phosphorus, and collagen can combine to enhance bone density and optimum bone health. As people age, their concern about bone density often increases. Many people choose to take a nutritional supplement to support bone health and promote bone density. Weak, brittle bones are more susceptible to fractures and breaks. 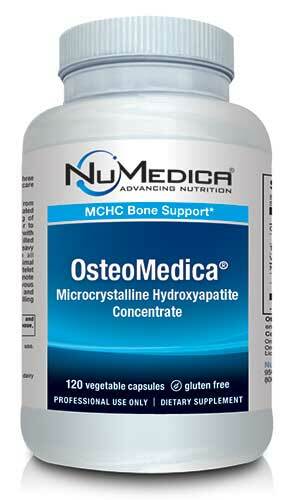 Taking NuMedica OsteoMedica provides more assurance that bones will remain strong. With this formula's inclusion of calcium and vitamin D, this supplement has the nutrition to offer a key support for bone health. If you want to protect your bones and ward off conditions like osteoporosis, a natural supplement that contains growth factors and other bone-enhancing ingredients can help. You can also take to your healthcare provider to get more information about how bone growth factors derived from healthy cattle can complement your bone density and health. DimaCal and TRAACS are registered trademarks of Albion International, Inc.
Other Ingredients: HPMC (vegetable capsule) and vegetable stearate. Contains No: Wheat, gluten, yeast, soy, dairy products, artificial colors, sweeteners or preservatives.